The weather was perfect, which was the first time in a year that it didn’t rain at least once during the race weekend. 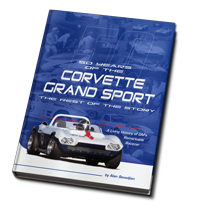 We only brought two cars at this year’s season kickoff race; Dr. Clair Schwendeman’s 68 Corvette and our Grand Sport. 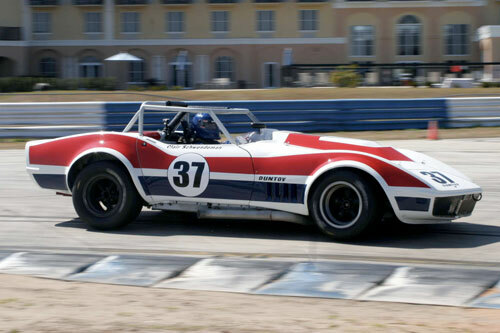 It was only Clair’s third race ever, but his second race weekend at Sebring. Clair’s car got a complete rebuild and new paint since his last visit to this place, and it looked and ran really great. 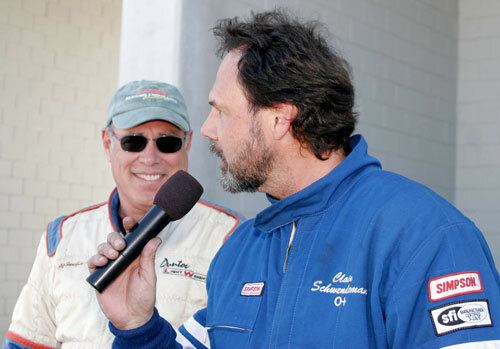 Clair finished second among Corvettes in the feature race on Sunday, second only to our Grand Sport. But the highlight of the weekend was Saturday’s Historic GT Enduro, after which Clair made his first trip to the podium! The plan was for Clair to start and go for 45 minutes, or to the first full course yellow after 30 minutes, whichever came first. For this race, HSR specified three mandatory 5 minute pit stops, and we hoped to make as many of them as possible under full course yellows. These races tend to have rather high attrition, and every hour or so you can pretty much count on a full course yellow and a safety car to bunch the field so the wreckers can haul off the stranded racecars. Edward was to drive after this first stop, with Alan next and Clair getting back in at the last stop to bring it home. We ran extra hard enduro brake pads, and of course we started on new tires. The plan was to change tires when necessary, but we hoped to run the entire race on the one set of brake pads. Clair’s first stint went well, and he came in after 45 minutes and pitted under green flag conditions. Unfortunately, Clair’s 68 has a 22 gallon fuel cell, and 45 minutes of green flag racing was about all it would run. Edward went out next and came in after only 30 minutes on a full course yellow. We changed the rear tires and Alan got in and ran until the next gas stop, but after fueling the team told him to get back in the car and off he went for another hour – some of which was run under the full course yellow. Towards the end of the race the track was getting slick with oil, and the rear tires on our car were about gone. Alan brought it in for a splash and go and Edward drove the final few laps to the finish. The car was perfect right up to the end. The 68 did not have a differential oil cooler, and the differential got so hot it melted and destroyed the composite rear leaf spring! That composite leaf was part of an assembly with several steel leafs with the one composite in the center, but even with the insulation of three steel leafs between the composite spring and the differential cover, the heat prevailed. 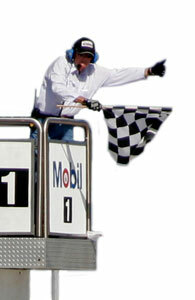 Edward finished the race by crossing the finish line in the pit lane! During the race we lost track of our GT1 competitors, with all the stops and yellow flags, etc. It takes timing and scoring and the transponders to tell the tale, and after a bit of confusion at the end of the race, the results were announced. We won by 6 laps, in spite of the extra pit stop! The Goodyear rears had worn to the fabric, but the Hoosiers on the front still looked good after 3 hours of hard racing! We changed the differential as a precaution and installed a new rear leaf spring and the car was ready for Sunday’s feature race. Clair, on the podium with the microphone; I am sure he will be there again soon! After the December race we had discovered metal in the oil scavenge screens and overhauled the engine. Our engine shop’s dyno was down, so we ran the valves and set the timing in our shop, then loaded for Sebring. The engine puked oil right off the bat during our first session on Thursday test day. It looked like the oil was coming from the front seal, so the rest of the day was spent changing it. Friday morning we went out and found we still had the same problem. It is a dry-sump engine of course, and the crankcase vacuum normally prevents oil leaks. We didn’t have a vacuum gauge in the car, but the evidence pointed to compression blow-by and we decided if we vented the valve covers, we might give the pressure someplace to go instead of out the front seal. It took a half-day to have fittings welded into the valve covers and to build and install the braided lines and breather can. We got permission to test this setup during the last practice session that preceded qualifying on Friday, and it was at least three times worse. We were black flagged! Of course we didn’t run that qualifying session and we were just about to throw in the towel when our engine man called in a suggestion. He asked us if we were running synthetic oil! We were, of course, but his point was that the engine had not been run on the dyno, and it needed a session with break-in oil. 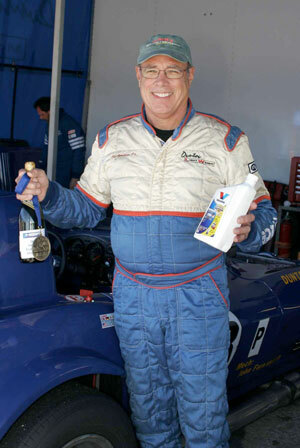 We drained out 3 gallons of Torco oil and replaced it with Valvoline street car oil; the closest thing we could get to break-in oil on Friday night in Sebring, Florida. Larry Ligas’s wicked fast Jag had blown up on Thursday. After qualifying, our fastest competitor looked to be Dennis Olthoff in the 7-liter GT40. Dennis is smooth and quick, and his car is well sorted. He was on the pole for the start of the first race on Saturday even though he had yet to mount new tires! The Chief Steward let us start 6th; outside, on the third row. Up to this point we hadn’t had any practice with the car all weekend, and we fully expected the car to begin puking oil any minute, but decided to go for it and run as hard as we could for as long as we could. That turned out to be enough to win the race. We were second in the first turn and passed for the lead at the end of the first lap. On Sunday we started from the pole and led every lap but the last one. This time we had a new excuse for losing a race we should have won. We ran out of gas. 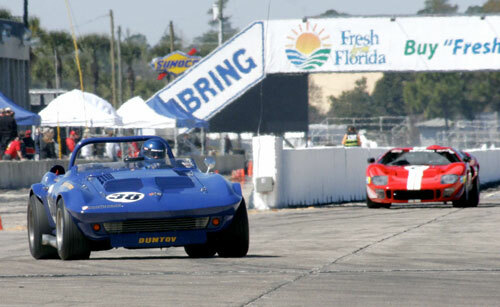 The Corvette Grand Sport and the GT40 at Sebring just like it was in 1966!